Team contact details can be created as links, allowing users to directly connect to all team members and their profiles. Keep track of team strengths and allow employees to identify teams that offer a key skill or resource. Easy to use, targeted full text search, to ensure all users can identify and contact any team within the organisation. Invotra’s team directory displays all teams on a designated landing page and allows users to search for all teams within an organisation. When a user identifies the required team, individual team profile pages provide detailed information about that team, including team members, locations, skills and any contact information. Users can select these details to contact colleagues directly or to find similar users and teams across their organisation. 1.Team contacts – Contact details are clearly displayed, in search results and on the full team profile page, and can be added as links to allow users to directly contact all colleagues in that team. 2. 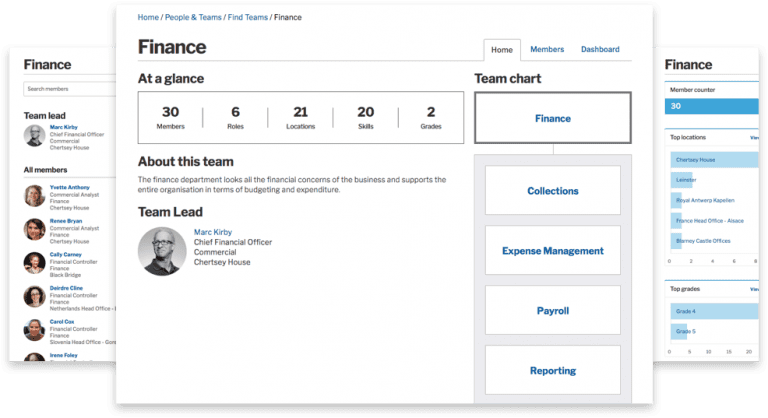 Team resources – Invotra team profiles include all the locations, skills and roles of all team members, and provide links to the profiles of each team member. 3. Team administration – A team administrator role can be given to any user, to ensure all of your employees are included in the right teams and team profiles are kept up to date. 4. Compatible with most existing HR systems – Invotra allows simple transfers of existing team data to your team directory profiles within Invotra People. 5. Search – Teams and all of their information are fully searchable. If required, searches can also be customised by site managers to only display required information.